In October 2015 at the 2nd World Seabird Conference in Cape Town, South Africa, an international collaboration was started to combine geolocator tracking data of Red-necked Phalaropes from breeding sites across the Western Palearctic. Now, a joint paper is published in Frontiers in Ecology and Evolution, showing a migratory divide between populations from Greenland, Iceland and Scotland migrating to the eastern Pacific, and populations in Fennoscandia and Russia migrating to the Arabian Sea. Especially the western route to the Pacific is amazing – a migration route not shared with any other Western Palearctic species. Phalaropes using the two routes and wintering areas differ in migration strategies and also in the amount of movements within the wintering area. Only few studies have shown such diversity in movement strategies among subpopulations within a species. It has been a tremendous job to collect all this data, especially because Red-necked Phalaropes are far less site-faithful than, for example, Long-tailed Skuas, albatrosses or other seabirds. Out of 10 geolocators deployed, on average 3 were resighted and recaptured. Even if recaptured, things can go wrong: some loggers failed prematurely and others were lost. 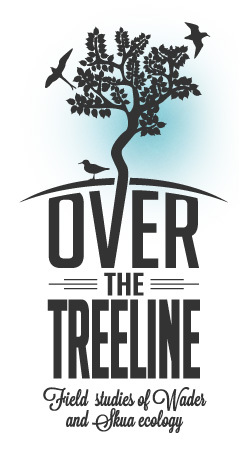 Considering the effort required for each and every logger, the paper is also a testament to the willingness of people to share their data and the power of international collaboration! Malcolm Smith, Aleksi Lehikoinen, who led the fieldwork at the other sites. We are very happy to share with you the publication of our last paper: “Habitat selection, diet and food availability of European Golden Plover Pluvialis apricaria chicks in Swedish Lapland”. It has been a long way but it is finally here!! Click here! This study shows the prey preferences of Golden plover chicks in the alpine tundra in northern Sweden, as well as their habitat use and food availability. Interestingly, a peak of bibios (Bibionidae, also known as marsh flies) at the end of the season in 2011, made the chicks change their diet to practically only feed on them, so we highlight the importance of this seasonal effects on the food availability, ergo diet, survival and growth of the chicks. We also show that plovers in Lapland do not have Tipulids (Crane Flies) as their favorite prey, as it happens to be in another population (UK), where chicks rely on them. We are recently working on the second part of this story, analysing which factors influence the growth of the chicks. Hope to show it to you soon! One of the aspects of migration that continues to fascinate people, is the ability of individuals to return to the same spot (either a wintering or breeding site), year after year. Such site-faithful individuals can be relatively easy to record, but recording site INfidelity has always been a major difficulty: if a bird doesn’t turn up where it was last year, you didn’t detect it, or it either moved or died. Tracking studies do not suffer from these problems, and now that tracking studies are producing data from individuals over multiple years, we can finally study the degree of consistency in routes and site selection over the entire annual cycle. Recently, we published a paper reporting on this subject in Long-tailed Skuas. The paper is published in a theme section on ‘individual variation in migration and foraging in seabirds’ of the journal Marine Ecology Progress Series and can be accessed here. Don’t forget to click on the supplement, which contains a nice animation of the tracks! Over half of the geolocator data used for this study was obtained from the Long-tailed Skuas in Ammarnäs, with the other part coming from colleagues working in Greenland and Svalbard. Together, we mapped nearly a hundred annual migrations of 38 individual Long-tailed Skuas. Several individuals were tracked over four or five years. The emerging pattern is remarkable. While Long-tailed Skuas are generally faithful to their route from the previous year, they occasionally choose to go somewhere completely different. The highest consistency is found in early winter, around the time when they arrive at the main wintering area. After mid-winter, individuals start to deviate from their previous route. Such deviations can be huge: one individual went to the Benguela Current in four years, but after arriving in the second and fourth year, it simply flew 5200 km across the Atlantic to spend the remainder of the winter in the Falkland Current, near Argentina! In both occasions it used virtually the same route to get there and ended up in the same area. These patterns suggest they first check out local conditions before deciding where to go subsequently: either continue on their usual route, or on some alternative. We also showed that individuals can show both ends of the spectrum: individuals showing ‘flexibility’ (deviations from their previous route), are not necessarily always flexible, they can also follow the same route twice. 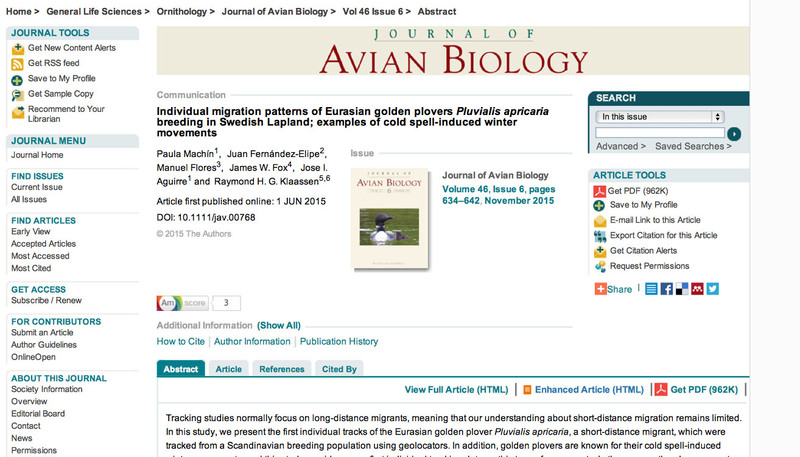 We have recently published the paper “Individual migration patterns of Eurasian golden plovers Pluvialis apricaria breeding in Swedish Lapland; examples of cold spell-induced winter movements”. 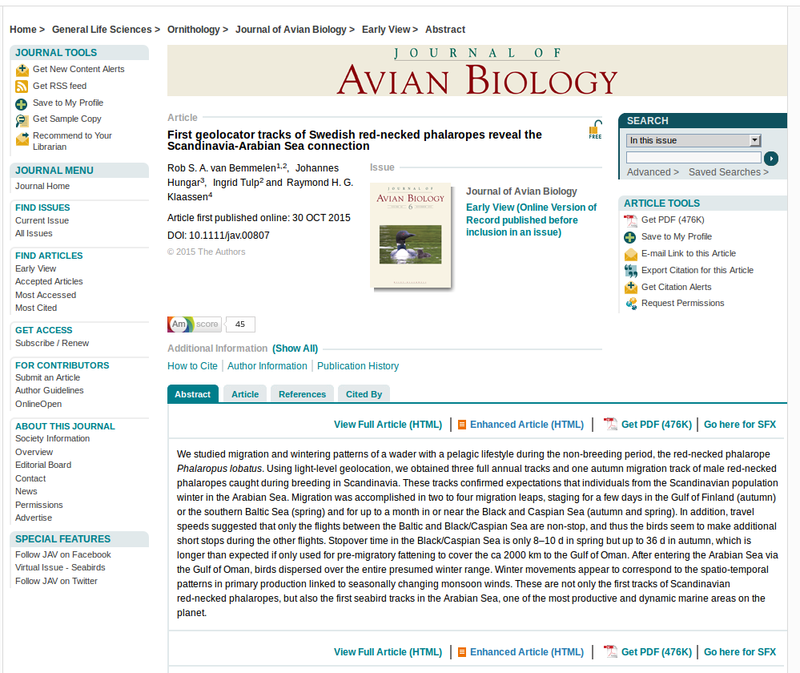 Read the complete article in Journal of Avian Biology or ask for a copy to machinpaula@gmail.com. 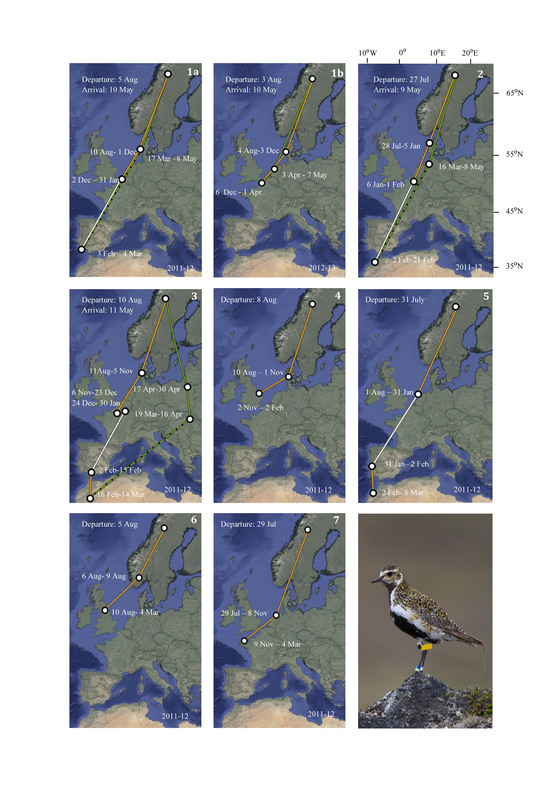 As you all may remember, in 2011 we placed geolocators on golden plovers in our study area located in Ammarnäs and retreived few of them in the subsequent seasons. Now we have published the data of their whereabouts with interesting results. Last week, the final version of a new paper on Red-necked Phalarope migration appeared online. It is titled ‘First geolocator tracks of Swedish red-necked phalaropes reveal the Scandinavian-Arabian Sea connection’. Read it at the Journal of Avian Biology website, or drop me a line and I’ll send it to you. Using the first four geolocators that we retrieved in Ammarnäs in 2014, we were able to confirm that these birds migrate all the way down to the Arabian Sea. This south-eastern direction is rather rare amongst European breeding birds. They covered the 6000-7000km in two to four migration leaps, of which the stretch between the Baltic and the Caspian Sea region (approximately 2500km) was covered in a non-stop flight. The autumn stopover in the Caspian Sea region was remarkably long (up to a month), which is more than what would be needed for refuelling to cover the next migration leap, to the Gulf of Oman. Why they stop for such a long time is unclear. Once they arrived in the Arabian Sea, they showed marked mobility, covering the entire wintering area between the southern Red Sea and offshore Pakistan. In the Arabian Sea, monsoon winds drive huge upwelling systems with marked variation in space and time. Possibly, the phalaropes tracked these variations in productivity, trying to be at the richest feeding grounds at the right time. Although the Arabian Sea is one of the most productive areas in the worlds’ ocean, our phalarope tracks represent (as far as we know) the first seabird tracks in this area. Thanks to all who have helped, in particular Vincent Hin and Tim van der Meer (who helped me in the field in 2013 and 2014, respectively) and Martin Green and Ake Lindström (Lund University)! One of the four geolocator tracks used for the paper.